4-20 is a place where friendship and passion for graphic design and visual communication met. It is a place to share new ideas and carrying out new projects. 4-20 at present is a graphic space set up by Daniela Cacace and Maria Cappadozzi. Daniela Cacace, graphic & web designer. 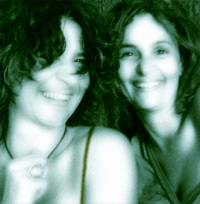 Daniela Cacace's profession as a graphic and web-site designer began in Rome in the 1990's. In this time, she founded, together with 5 friends, an internet service that created and designed web and multimedia projects for various companies and regional bureaus. These included, Agorà Telematica, the Alderman of the Regional agricultural department of Lazio, Ethicon Endo-Surgery, Fax Art, Plastic Museum in Torino, San Paolo IMI, La Borsa del Libro and Nomisma. In 1996, Daniela collaborated with the advertising agency "Dolci", creating for one of their many important clients, Nissan Italia, their first official web-site. She worked with the agency "Dolci" until 1999. Within this time she directed and carried out graphic and multimedia projects for the following companies: Nissan, Bmw, Playtex, Istituto Europeo di Design, Censis, TIM, Ethicon Endo-Surgery, Pino Daniele, Confcommercio. During this period, she began teaching "Web design" at the Institute of Communications (ISC) in Rome. In 2000, Daniela moved to Madrid where she worked as a senior graphic designer for a Spanish web agency. After a period abroad, she returned to Rome in 2003, where she began her work as a freelance designer. At present, Daniela designs graphic projects for various formats. Brochures, posters, play-bills, projects for interior design, graphics for cd-rom, websites for the FAO, Ministero dei Beni Culturali, Finanzio Facile Spa, AIC Progetti, Collina Spa, Cartoni Spa, Centro Benenzon España, Onesis Spa, VD Music School. She is part of the consulting expertise of the FAO and is a teacher of "Interface design" in the department of visual arts, at the European Institute of Design (IED) in Rome. From 1996 is a FAO (Food and Agriculture Organization of the United Nations) consultant to plan the concept and develop of design for: posters, brochures, booklet, illustrated books, fact-sheets and image projects, overseeing the entire projects from inception to final printed pieces. Searching for a graphic style simple and direct, and a communication based on special attitude towards the hunger matters. 1994-1998. Art direction of the graphics team of “Sothis Editrice srl” and layout of all publications, including the monthly magazine “La Clessidra” responsible for high resolution scanning and photo retouching of chosen imagery. She directed and carried out graphic projects for Citizen, Fossil, Bulgari, Revue Thommen, Pryngeps. 1991-1994. Collaborated as a graphics designer for a design and publishing agency “Ricciardi & Associati” srl gaining experience in all areas of graphic design and production of books, brochures, annual reports, fact-sheets and fliers for various companies. These includes FS Ferrovie dello Stato, Renault Italia, Editrice l’Automobile e Urmet Sud. 1986-1989. Editing and production of illustrated books for Mondadori and De Agostini.